Hello, hello! I finally got to eat some pho again last night! I wanted to get my blog entry done a little earlier this week, so last night Dana and I were debating on where we should go. There were a few options up for consideration, such as Old Chicago, where I have never been, Shige Sushi Japanese Kitchen, or a Vietnamese restaurant of our choice in Santa Rosa. 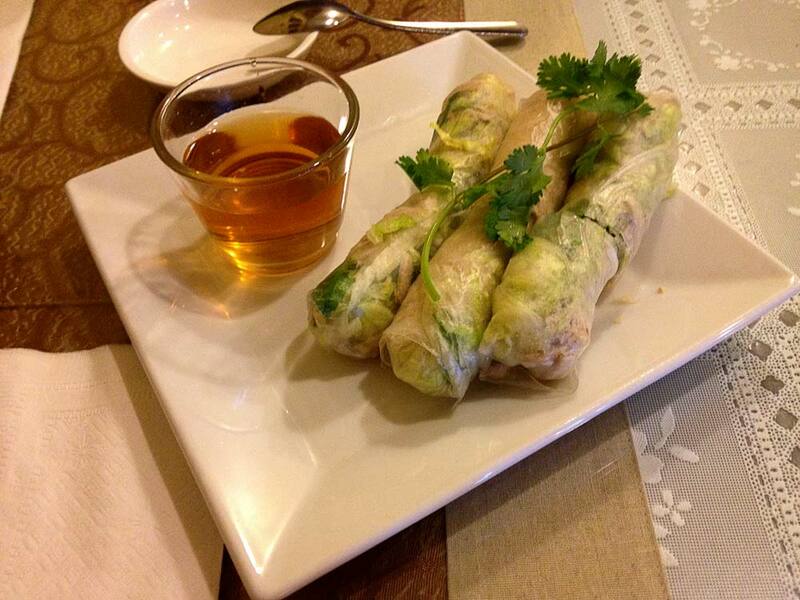 After some discussion, we decided to eat at Mai Vietnamese Cuisine. Let’s just get the bad out of the way now: the service at this restaurant is absolutely abysmal. Dana has an issue with a previous experience we had, so convincing him to go here last night was a bit difficult. About two years ago, one of the managers refused to honor a gift certificate. I do not remember why, but it was a problem. That left a bad taste in our mouths, which is a shame because we really enjoy the food. I also had a somewhat negative experience when my sister and I went recently. The same woman who would not honor our gift certificate was taking our order, and when we ordered a bowl of pho that we had decided to share, she asked, “Is that it?” “Yes.” And in a response, we got a very disappointed, “Oh…” from her. She was not intentionally rude, but she got a little too emotional about us ordering one item, at least for my taste. 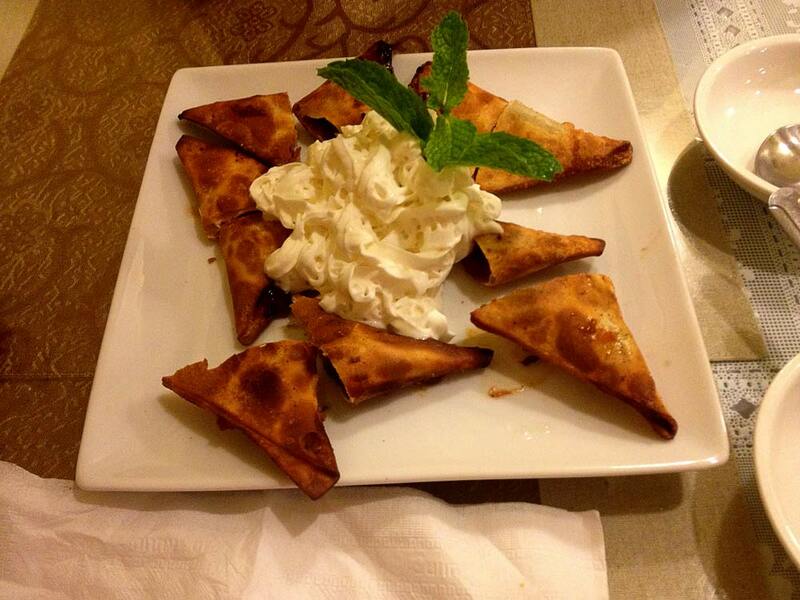 And of course last night… while we overall enjoyed our meal, we had some problems with our service. First, when we arrived, we were not given menus for a good five minutes until I said something. Secondly, I had to remind them to bring me my beer. It did not show up until after our appetizer. So, in general, the service is pretty bad. I do not think anyone working there is trying to be rude, but they could probably use Gordon Ramsay for a day to set things straight. Fortunately, Mai makes up for their bad service with great food. The appetizer we ate last night was a plate of shredded pork rolls. I found them delicious, but Dana was not impressed. One aspect we both agree on is that the pork was very, very dry and flavorless. I would have much preferred a vegetarian spring roll. The herbs, veggies, and sauce saved this dish from being a complete disaster. I finally got my beer when we were halfway done with the pork rolls! Hooray! This was my first time having 33. It tastes like any typical wheat beer, except it has a very different finish that tasted of some kind of spice, and I just could not put my finger on what it was. 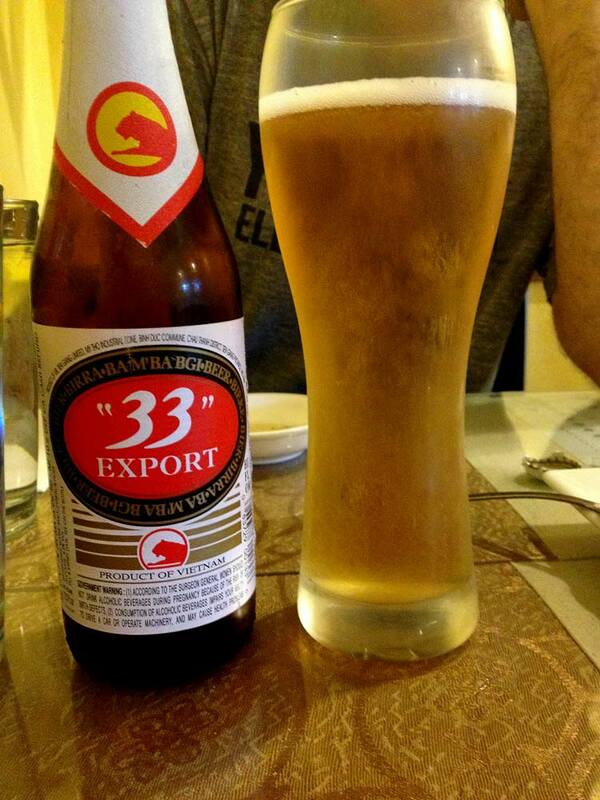 The beer was not so bad, if you enjoy beer with little flavor. Dana decided to order the Bun Cha Gio Tom Thit Nuong. I have no idea what that directly translates to. 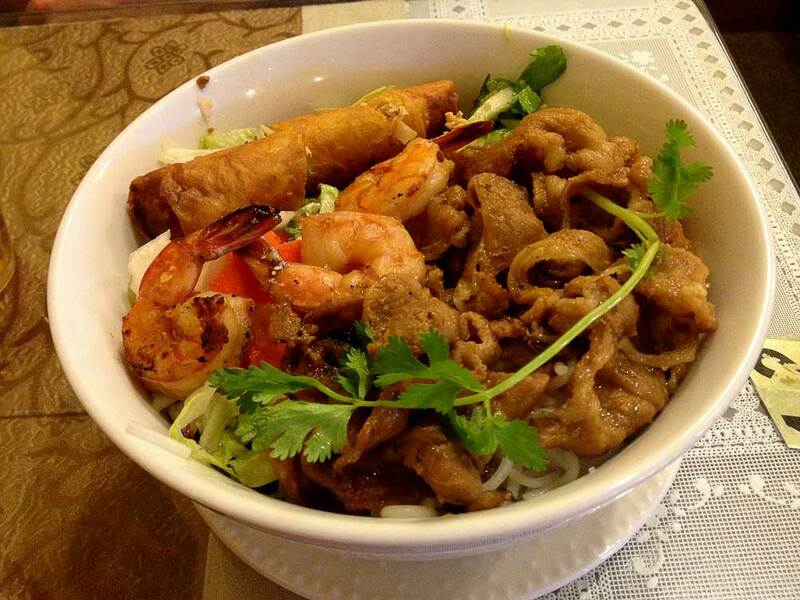 I do know that we both love pork, shrimp, egg rolls, and vermicelli noodles. I got to taste the pork, which much more flavorful, although fattier (which is not really a bad thing), than the pork in the shredded pork rolls. I also was able to taste the noodles and veggies mixed together and they were really tasty. 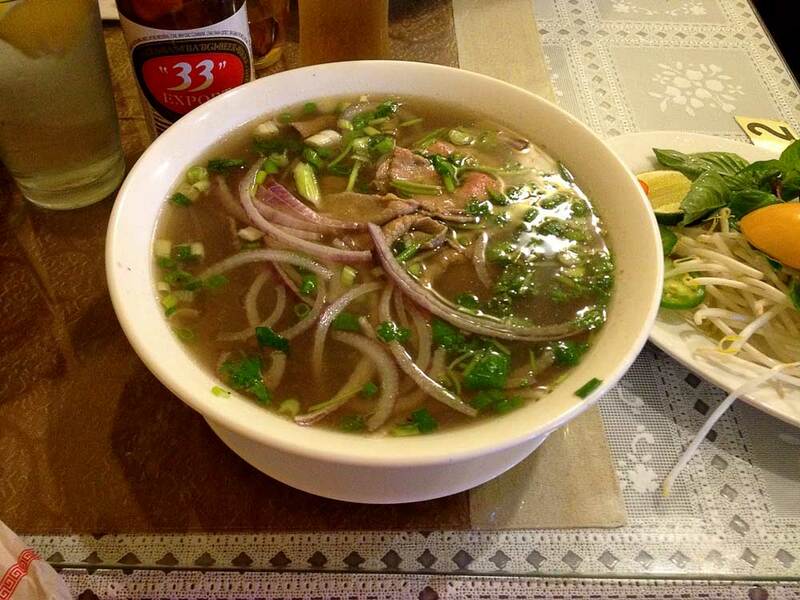 I would order this myself next time I come back if I am not feeling pho (which is a rarity). Yes! My pho arrived a little bit after Dana’s entree (another issue with this restaurant). And just like last time at this restaurant, it was so incredibly delicious. I am a bit new to loving pho, but last time I had it was at Noodle Mania in Sebastopol, whose pho just tastes like store-bought beef broth! Here, you can taste all of the spices, and it actually tastes homemade, and that is probably because it is! It was so refreshing, and I cannot wait to enjoy it again! Holy $#!^! This was so yummy. I think it is really difficult to screw up deep fried sugar with cream, however. I am not entirely sure what the fruit was, but it tasted like berry jam. The fact that it only says “fruit-stuffed” on the menu is a bit suspicious. But like I said, it was tasty, so I cannot complain much. That about wraps up our meal. 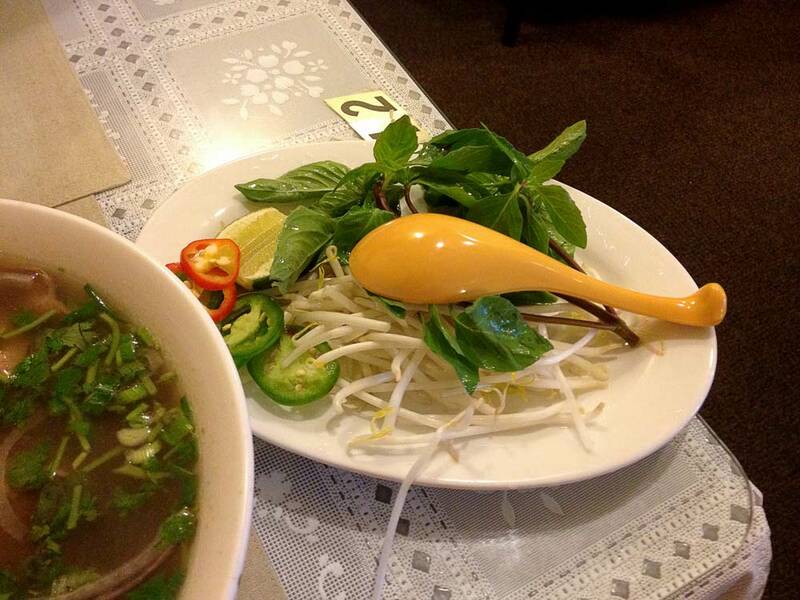 If you really love pho or Vietnamese food in general and you can tolerate lousy service, give Mai Vietnamese a try! Glad I already had lunch before reading this! I’m reading it again and want more…. I really enjoy the posts you make! easy to follow with a bit of a laugh. great work! also, this blog makes me really freaking hungry! She is super proud of her restaurant and will often be seen picking up even the tiniest crumb off of the floor. She told me that’s the reason she doesn’t serve Banh Mi. I find that the best way to experience Mai Vietnamese is to adapt more of a “go with the flow” attitude. I don’t ever choose my meal, I just tell Lynn that I would like, “something spicy” or “something fresh tasting”. She will often have the kitchen whip you up something special that is off the menu! Not only that, she will give you the recipe to! I understand people have their own quirks, and for Lynn, I guess it’s being sassy. That’s perfectly okay in a more casual setting. However, I do not know her well enough to know this about her and first impressions are everything, especially in a professional environment. There is a time and a place for everything, and when a business owner/manager has new customers in her restaurant (or in this case, customers she has seen but doesn’t know well yet), she needs to put her friendly, professional face on. Fortunately for her, I am actually really forgiving of shoddy service if the food is phenomenal, which it is (unless it’s blatantly rude… in this case I excused her assuming it was a cultural difference and misunderstanding). I only mentioned it here because for people who are less forgiving, it’s a good thing to know. If I knew her well and she were sassy with me, I’d be perfectly okay with it. I frequent Hana Japanese Restaurant in Rohnert Park, and the servers and chefs tease me all the time, which is fine because I know them and they know me. All that said, not honoring our gift certificate is pretty inexcusable. Sassy or not, I think Lynn has a thing or two to learn about business ethics.